(Francisco Kjolseth | The Salt Lake Tribune) Utah Utes guard Dru Gylten (10) stretches past UCLA Bruins guard Ahlana Smith (2) for the basket at the Jon M. Huntsman Center in Salt Lake City on Sunday, Feb. 10, 2019. (Francisco Kjolseth | The Salt Lake Tribune) Utah Utes guard/forward Dre'Una Edwards (44) lays one up over UCLA Bruins guard Lindsey Corsaro (4) at the Jon M. Huntsman Center in Salt Lake City on Sunday, Feb. 10, 2019. 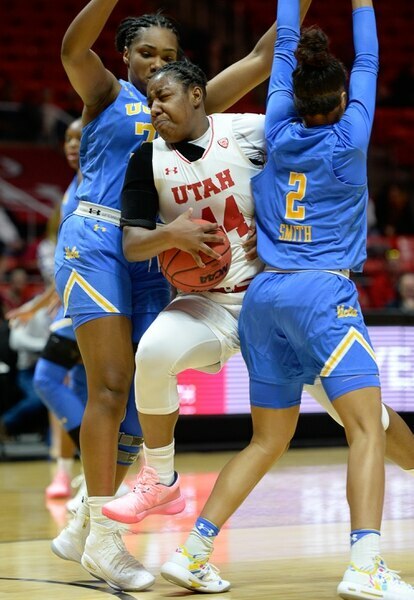 (Francisco Kjolseth | The Salt Lake Tribune) Utah Utes guard/forward Dre'Una Edwards (44) tries to push past the UCLA defense at the Jon M. Huntsman Center in Salt Lake City on Sunday, Feb. 10, 2019. (Francisco Kjolseth | The Salt Lake Tribune) Utah Utes forward Megan Huff (5) is helped up by teammates after a hard hit by the UCLA defense at the Jon M. Huntsman Center in Salt Lake City on Sunday, Feb. 10, 2019. (Francisco Kjolseth | The Salt Lake Tribune) Utah Utes forward Megan Huff (5) battles UCLA for a loose ball at the Jon M. Huntsman Center in Salt Lake City on Sunday, Feb. 10, 2019. 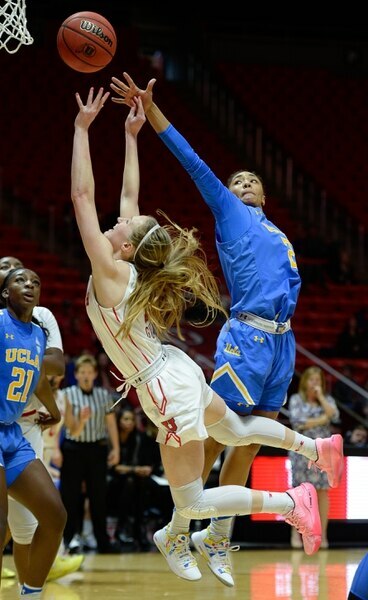 (Francisco Kjolseth | The Salt Lake Tribune) UCLA Bruins guard Lindsey Corsaro (4) blocks Utah Utes guard Kiana Moore (0) at the Jon M. Huntsman Center in Salt Lake City on Sunday, Feb. 10, 2019. (Francisco Kjolseth | The Salt Lake Tribune) Utah Utes guard Kiana Moore (0) slips past UCLA Bruins guard Lindsey Corsaro (4) at the Jon M. Huntsman Center in Salt Lake City on Sunday, Feb. 10, 2019. (Francisco Kjolseth | The Salt Lake Tribune) UCLA Bruins forward Lauryn Miller (33) battles Utah Utes guard/forward Dre'Una Edwards (44) for a loose ball at the Jon M. Huntsman Center in Salt Lake City on Sunday, Feb. 10, 2019. (Francisco Kjolseth | The Salt Lake Tribune) Utah Utes forward Megan Huff (5) loses control of the ball as she's pressured by UCLA at the Jon M. Huntsman Center in Salt Lake City on Sunday, Feb. 10, 2019. (Francisco Kjolseth | The Salt Lake Tribune) Utah head coach Lynne Roberts begins expresses her anger at the referees as UCLA begins to slip away on their way to a 90-100 loss at the Jon M. Huntsman Center in Salt Lake City on Sunday, Feb. 10, 2019. (Francisco Kjolseth | The Salt Lake Tribune) Utah Utes guard Dru Gylten (10) is pressured by the UCLA defense at the Jon M. Huntsman Center in Salt Lake City on Sunday, Feb. 10, 2019. (Francisco Kjolseth | The Salt Lake Tribune) Utah Utes guard/forward Niyah Becker (3) drives the ball against UCLA at the Jon M. Huntsman Center in Salt Lake City on Sunday, Feb. 10, 2019. (Francisco Kjolseth | The Salt Lake Tribune) Utah Utes guard/forward Dre'Una Edwards (44) leans back as she shoots over UCLA Bruins forward Michaela Onyenwere (21) at the Jon M. Huntsman Center in Salt Lake City on Sunday, Feb. 10, 2019. (Francisco Kjolseth | The Salt Lake Tribune) Utah head coach Lynne Roberts begins to show her frustration as UCLA begins to slip away on their way to a 90-100 loss at the Jon M. Huntsman Center in Salt Lake City on Sunday, Feb. 10, 2019. 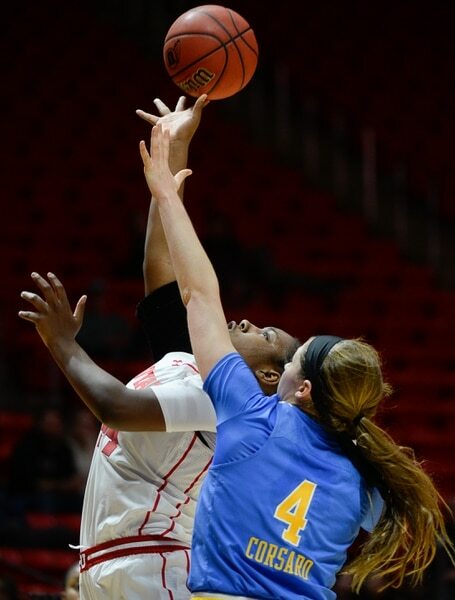 (Francisco Kjolseth | The Salt Lake Tribune) UCLA Bruins forward Lajahna Drummer (11) pressures Utah Utes forward Megan Huff (5) at the Jon M. Huntsman Center in Salt Lake City on Sunday, Feb. 10, 2019. (Francisco Kjolseth | The Salt Lake Tribune) Utah Utes guard/forward Dre'Una Edwards (44) pushes past UCLA as she keeps her eye on the basket at the Jon M. Huntsman Center in Salt Lake City on Sunday, Feb. 10, 2019. (Francisco Kjolseth | The Salt Lake Tribune) Utah Utes guard Kiana Moore (0) gets roughed up by the UCLA defense at the Jon M. Huntsman Center in Salt Lake City on Sunday, Feb. 10, 2019. (Francisco Kjolseth | The Salt Lake Tribune) Utah Utes guard Kiana Moore (0) takes off down court against UCLA at the Jon M. Huntsman Center in Salt Lake City on Sunday, Feb. 10, 2019. (Francisco Kjolseth | The Salt Lake Tribune) Utah head coach Lynne Robertsat rallies her team in the final minutes of play against UCLA at the Jon M. Huntsman Center in Salt Lake City on Sunday, Feb. 10, 2019. UCLA slipped away for the win 100-90. The AP voters spoiled that strategy. Utah's Top 25 ranking took away the underdog label and gave it to two visiting opponents, who caused all kinds of problems at the Huntsman Center. UCLA's 100-90 victory Sunday marked No. 17 Utah's fourth straight loss. The latest one hurt, beyond the certainty of Utah's falling out of the rankings Monday. UCLA (14-9, 8-4 Pac-12) dropped Utah (18-5, 7-5) into sixth place in the conference with six regular-season games remaining. The top four teams receive first-round byes in the Pac-12 tournament. The Utes initially responded well to their Top 25 status in late January. They beat highly regarded California, upset Stanford and led top-10 teams Oregon and Oregon State in the fourth quarter on the road, before losing. Utah fell apart, though, in the second halves of home losses to USC and UCLA. The Bruins earned their victory by making 11 of 15 shots from the field in the fourth quarter and scoring 40 points. Partly because the Utes' fouling extended the game after they fell behind by 17, Utah allowed 100 points for the first time since a four-overtime game in 2010. In regulation, no opponent had scored 100 since 1986. All day, the Utes seemingly were about to take control of the game, only to miss layups and have the Bruins score inside. The tone changed when Ute senior forward Megan Huff picked up her fourth foul late in the third quarter and went to the bench, with her team leading 52-51. UCLA's Japreece Dean hit a 3-pointer at the buzzer for a 60-56 lead. UCLA shot 56.1 percent from the field, with three players combining for 75 points: Kennedy Burke (26), Onyenwere (25) and Dean (24). Huff posted 23 points and 13 rebounds, freshman Dre'Una Edwards scored a season-high 21 and Kiana Moore added 17 for Utah. Yet the Utes' lapses at both ends of the court kept them from getting any separation in the first three quarters, when they looked like the better team. The Utes will play Friday at Arizona, and then they’ll be underdogs at No. 20 Arizona State next Sunday. Maybe they’ll embrace that role again.